Proving that marketing works while justifying costs constantly challenges today’s marketing leaders. In a world of big data and technology that measures marketing output, business is ruled by the bottom line. Those who fail to pass muster, lose. So if marketers must justify their value, how do you value visual branding and design? Because of new marketing technology, qualitative design concepts can be sidelined or deprioritized. Design ends up being thought “wooly-headed” and a “nice-to-have” instead of essential and contributing to revenue growth. Just because it’s difficult to quantify, doesn’t mean there’s no value. Human emotions color our logical decisions. Design and brand create symbolism and take brand positioning beyond a pure ROI argument. They help position your company visually, and convince your potential clients that emotionally, you have an authentic solution. A marketing team has a massive variety of design needs. These demands continue to compound daily, monthly, and yearly. Design project range from expensive flagship campaigns to the smallest sales brochures — and everything in-between. When design doesn’t happen, marketing doesn’t happen. Full stop. Design isn’t a fad, but instead a way for problem solvers (that’s you!) to develop innovative solutions. That’s the real bottom line. SketchDeck clients are marketing teams who’ve recognized this truth. They know the problems with creating and delivering day-to-day design content. While considering solutions, they generally narrow down to two potential options: they either consider hiring an in-house team, or they use SketchDeck. A marketing executive who’s always worked with in-house teams probably considers the former as the default. Nobody ever got fired for hiring in-house. But an in-house team requires far more resources and maintenance. It’s a permanent overhead cost. Scaling in-house means building out another entire function within your business. Imagine how much better your marketing ROI would be not having to pay for that. Let’s explore a comparison between SketchDeck and in-house. We’ll cover the actual costs and benefits of using SketchDeck versus an in-house team. We’ll also examine how a variety of situations will impact your decisions in a variety of real business scenarios, and why SketchDeck often nets out as the most effective solution. Making a good comparison needs a careful selection of characteristics to analyze. In this analysis, we’ve taken into account the time and salary of a number of positions. We assume talent, skill set and qualities of a mid-level designer, who will require supervisory time and some hiring and onboarding. We’ve included the salary, office utilization, and benefits of each of these functions — including sick days, vacation days, and work hours each week. Of course, the number one question anybody wants to know about a design project is, “When will this be done, exactly?” We’ve ignored that in these numbers. Although the speed of delivery is essential and both options can be very fast, it’s also very difficult to put a value on. There are also other organizational benefits that wouldn’t show up in a balance sheet which we’ll compare at the end of the article. 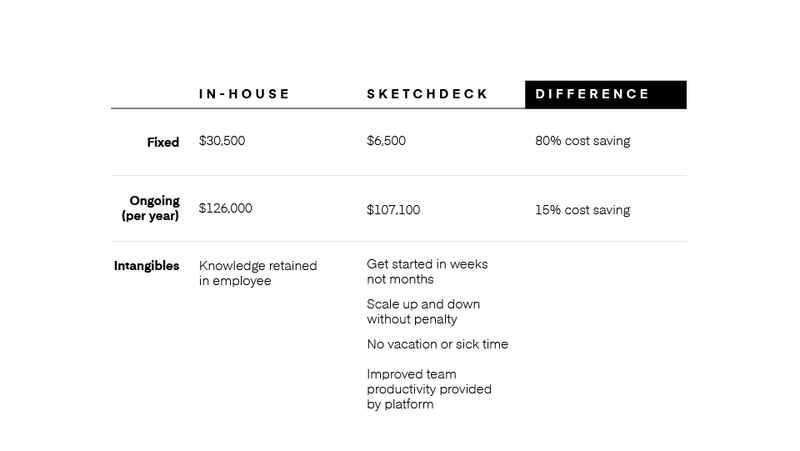 SketchDeck represents an 15% savings over hiring in-house on an annual basis. And that’s in the best case! What happens if there’s an extenuating circumstance in the business? In the next section we’ll explore the effect of several common scenarios on this comparison. Business never goes perfectly. Forecasts fall short, markets change, and employees quit. All of these and more can dramatically impact whether a service or hire will actually see a return. Let’s explore a few scenarios to see how that changes the comparison. First, fluctuating design needs are a common challenge. Sometimes design needs shrink during the summer, or might spike in response to an event. Common examples of these events are presentation decks for sales kickoffs, or social media campaigns requiring thousands of advertisement versions. Our clients usually see their needs change daily and monthly, either increasing or decreasing in the range of about 20%. Some clients see their needs drop to almost zero in the summer months. Others get extraordinarily busy in the back to school season. Much of the specifics depend on the seasonality of the business as well as the industry. Fluctuations in-house design look much less attractive. Suddenly during down times, you have a designer who is idle, or working on designs that don’t bring a big impact. During busy times, they end up being stretched and the work doesn’t have the emotional impact it should. SketchDeck doesn’t have this issue. We’re built to be an on-demand design team, so by definition, we’re available whenever you need us-embers are only charged for what they use. You wouldn’t expect to pay for an Uber that you’re not riding in, and the same goes for our services. SketchDeck represents a 28% savings over in-house in this fluctuating needs scenario — even more dramatic savings than the basic case! Since this scenario happens in almost every business, we believe that it holds more water as a representation of the savings our clients see using SketchDeck. Some clients don’t have enough design needs to warrant a full-time hire. Typically the company employs between 20-50 people, and maybe have less than 15 hours a week of design needs. Before approaching SketchDeck, these clients have had getting extremely inconsistent design because they have churned through a wide variety of solutions. In spite of these small needs, hiring a designer often happens anyway. This turns inefficient fast, and results in the designer taking on a hybrid role in the company to fill their time. For example, the designer may take on administrative responsibilities. Alternately, you can just ignore the day-to-day design. This isn’t ideal as it just pushes more work on to full-time employees. 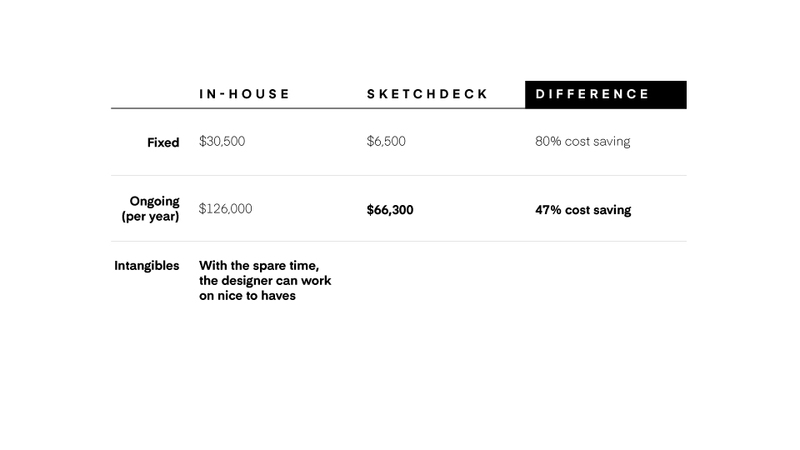 SketchDeck represents a 47% savings over in-house in this scenario. Everyone wants their company to grow fast. But doing so can break your company’s processes at an eye-popping speed. If you’re growing 50%+ per year, the marketing and design work you create one month will be totally outdated and underwhelming the next. 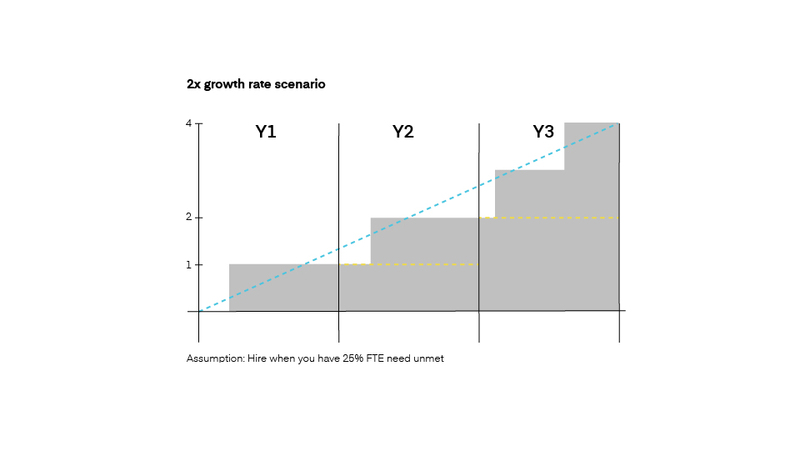 In a fast growth scenario, there are three key challenges to hiring in-house. First, any time spent on design comes at the expense of hitting and achieving growth metrics. Also, you can only hire in discrete units, while demand will grow continuously. A subtler point, it means that hiring will lead to designer time surpluses and constraints. Finally, hiring doesn’t ever turn into “just” a fixed cost — instead, it turns into an ongoing marginal cost. In other words —it’s a permanent tax that drains your marketing operations. Supply surpluses and constraints. Black line = in-house FTE designers. 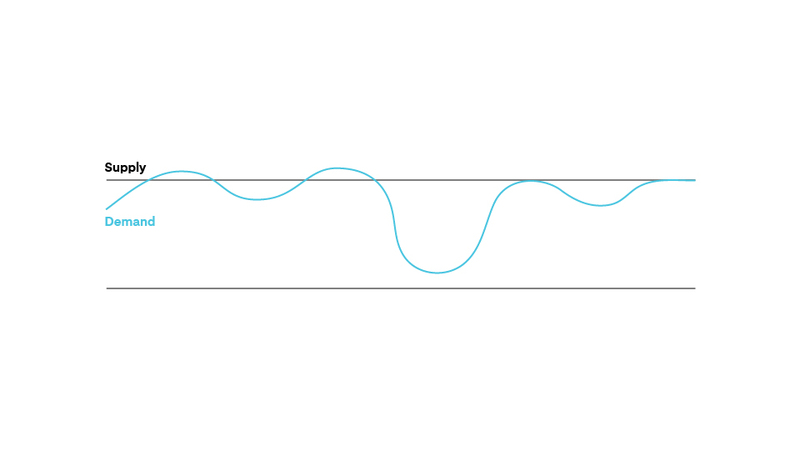 Blue line = demand = sketchdeck supply. Comparing costs requires a multi-year comparison. 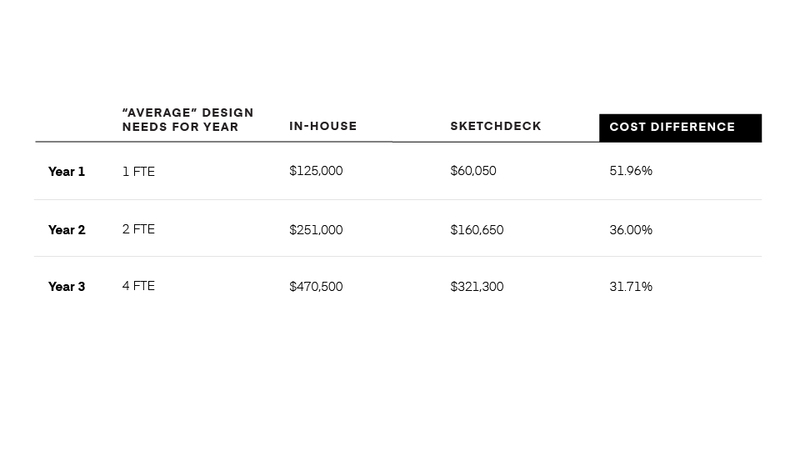 In the fast growth scenario, SketchDeck saves 51% over hiring in-house. As your company grows, this cost difference becomes less dramatic due to economies of scale. That said, a minimum cost savings of 31% still impresses. If you’re looking to compare in-house to SketchDeck, and none of these scenarios apply to you, we’re still happy to help. Click here to schedule a meeting. We’ll make a custom analysis on your behalf, and customized to your specific business situation. In comparing the two options. SketchDeck cuts costs in every case, with savings over a year ranging from 15-50%. If your business has less predictable factors, you’re likely to be on the higher end of the savings comparison. With multiple levels of plans, SketchDeck presents a low upfront cost alternative to a time-intensive and expensive hire. Ready to start seeing benefits from a more effective design process? SketchDeck has your back. From our entry-level team plan to our customizable enterprise plan, we have two offerings for organizations of all sizes. Option 1: If you have a project you’d like to get design started on now, click here to fill out a brief and send it to the team. In five minutes you’ll have a quote and timeline. Depending on the project, you can expect your first draft back within just a day or two. Option 2: For teams ready to improve their design process and needing more info, schedule a call online with our talented design consultants. We’ll listen to your specific situation and present the best solution tailored to fit your needs.